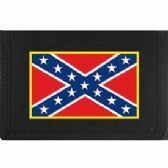 You are Purchasing a Heavy Duty Rebal Flag Wallet. The wallet size colsed is approx 20mm D x 90mm W x 130mm L. The size of the wallet open is approx 3mm D x 265mm W x 130mm L It is made from Heavy Duty Nylon It fastens via Velcro There is one large pocket for notes One ID card pocket Four other pockets Would make a great gift This item is made in the United States of America. 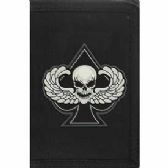 You are Purchasing a Heavy Duty Winged Skull Deaths Head Ace of Spades Wallet. The wallet size colsed is approx 20mm D x 90mm W x 130mm L. The size of the wallet open is approx 3mm D x 265mm W x 130mm L It is made from Heavy Duty Nylon It fastens via Velcro There is one large pocket for notes One ID card pocket Four other pockets Would make a great gift This item is made in the United States of America. 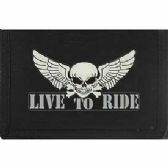 You are Purchasing a Heavy Duty Winged Skull Live to Ride Wallet. The wallet size colsed is approx 20mm D x 90mm W x 130mm L. The size of the wallet open is approx 3mm D x 265mm W x 130mm L It is made from Heavy Duty Nylon It fastens via Velcro There is one large pocket for notes One ID card pocket Four other pockets Would make a great gift This item is made in the United States of America.